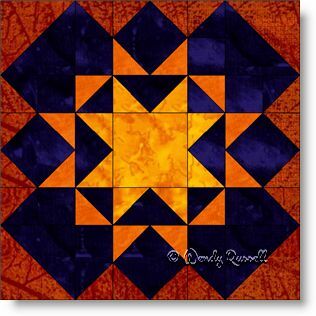 The Blazing Star quilt block is an eight patch block with lots of pieces. However, with careful attention to detail, this is an easy block to construct as an uneven nine patch. I like that method as you get to work in "chunks" rather than sewing row by row. The block gets you lots of practice making half square triangles, square in a square patches, and also (my favourite) patch, the flying geese unit. I chose the obvious colours for this block -- as a star in the night sky. You might choose a totally different colour scheme and the resultant block will be striking. The sample quilts illustrated use standard settings for the blocks -- a side by side layout as well as an on point layout with additional sashing strips.